I hadn't thought one bit about squalane until I started seeing the ingredient in oils everywhere. I had seen it randomly on Sephora website, but have always been really adverse to putting oil on my skin. After trying and loving The Ordinary's 100% Plant-Derived Squalane, I thought why not try the Biossance Squalane, especially since the brand offers free samples! The samples available are the 100% Squalane Oil and the Squalane + Vitamin C Rose Oil. 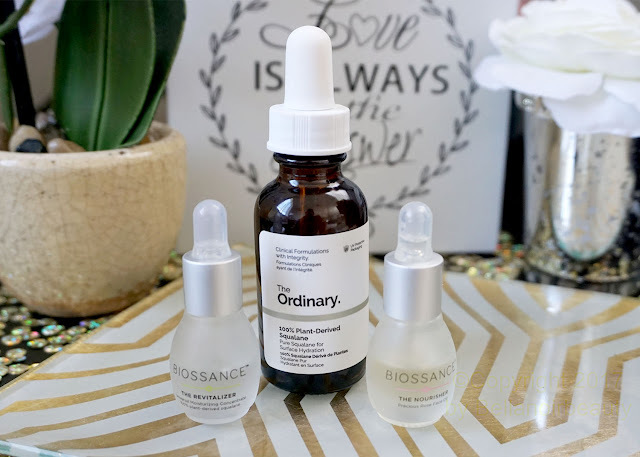 I'll be talking about both of the Biossance Squalanes in this post, plus providing a comparison review of the Biossance 100% Squalane Oil and The Ordinary 100% Plant-Derived Squalane, which I have already reviewed. 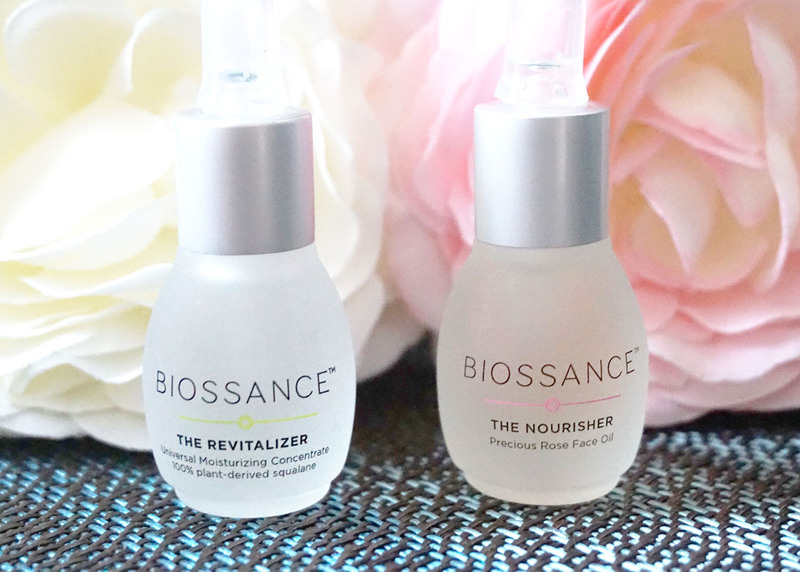 The Biossance oils are a good-sized sample; you receive 4 ml or 0.14 fl. oz. of each oil. You do have to pay $4.00 in shipping, but it's a small price; every day use of both should last well into a month. Oily, acne scarring on cheeks. The primary function of both the Biossance and The Ordinary Squalane oils is to moisturize. Biossance claims their 100% Squalane Oil is also supposed to accelerate skin turnover and make your skin appear smoother. The Ordinary Squalane claims only hydration. The Squalane Vitamin C Rose Oil uses Tetrahexyldecyl Ascorbate, which Biossance claims is supposed to brighten 50X better than ascorbic acid. 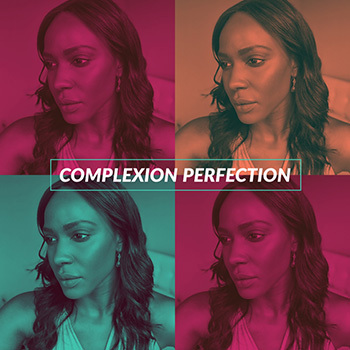 This oil is also supposed to reduce the appearance of fine lines. As with The Ordinary, Biossance describes their squalane as 100% plant-derived squalane. However, Biossance produces their 100% plant-derived squalane from sugarcane while The Ordinary does not specify which plant(s) they derive their squalane from. I use these as a first moisturizer because unlike The Ordinary's Squalane, the Biossance Squalane Oil absorbs more into your skin and doesn't sort of leave a layer of oil on top of your skin like The Ordinary version. I follow up with a heavier cream with the Biossance oils, especially at night. I started using the Biossance oils at the very end of April. See review of The Ordinary Squalane here. The regular price of the Biossance 100% Squalane is $58.00 for 3.3 fl. oz or 100 ml. This works out to $17.16 for one fl. oz. As a comparison, the Ordinary sells their squalane at $7.90 for 1 fl. oz., so right off the bat, The Ordinary's squalane is a better value. 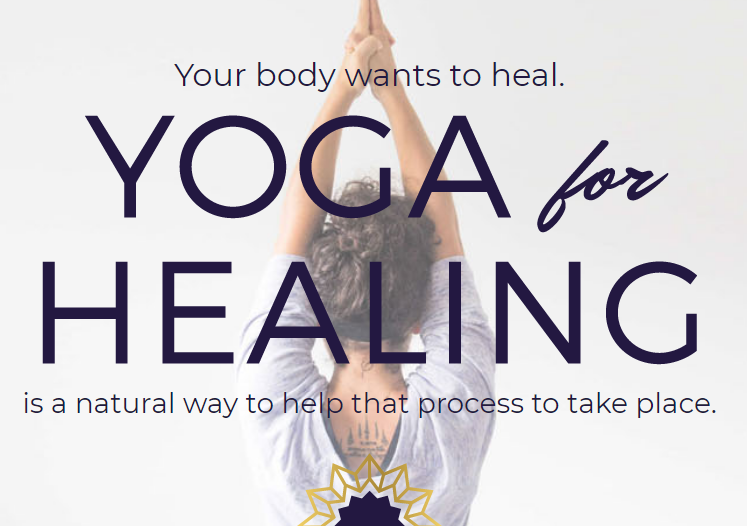 The Vitamin C Rose Oil is $15.00 more (it's $72.00) for 1 fl. oz. I like the price of The Ordinary's squalane and I really love the way The Ordinary's squalane makes my face feel. Biossance's oils feel a lot thinner than The Ordinary's as well. Both the Biossance and The Ordinary Squalanes provide great moisture, but each has a different feel on the face to them. It's less obvious that you've put oil on your face with the Biossance Squalane. Biossance's squalane has no smell at all (either of the oils) but The Ordinary's squalane smells faintly of some kind of plant. I prefer the Biossance in this category. I'll also mention that it's probably too early to judge the Squalane + Vitamin C Rose Oil, based on what the brand claims it does. I haven't seen any brightening effects but it has only been a little over 15 days and not enough time to make a good judgment. Overall, the Biossance squalane has more character, but I ironically prefer The Ordinary squalane on my oily skin because I like the way it feels on my face more and the price is right. Remember YMMV! I'm surprised I prefer the thicker oil from The Ordinary and I think a lot of people might prefer the Biossance oils for the formulas.